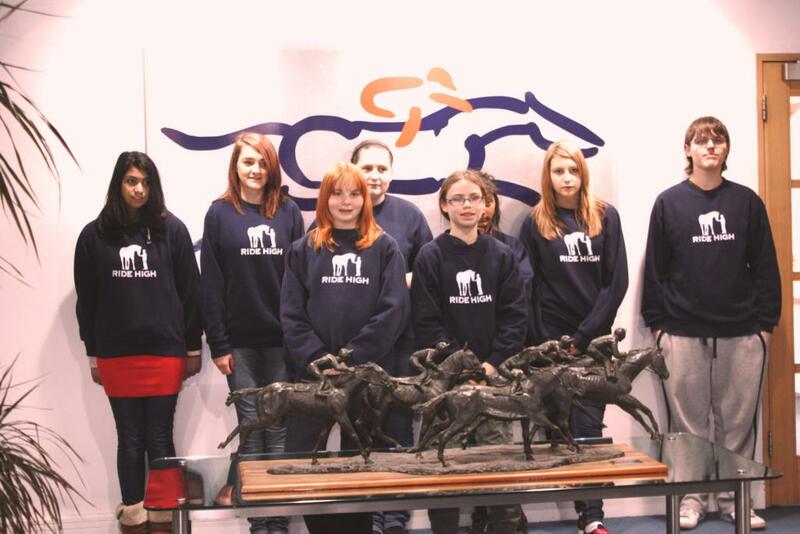 At The British Racing School we strive to make contact with children and young people who might not otherwise have considered working in the racing industry. We work with city farms such as Deen City Farm and Mudchute Farm in London and today we welcomed Ride High for the first time. Ride High is a charity based in Milton Keynes which aims to help disadvantag ed children and those having difficulties in their daily lives, by giving them the opportunity to learn to ride and look after horses and ponies. There is evidence that for children who are angry, hurt, upset, lonely or underprivileged, contact with horses can have highly beneficial effects. Children who exhibit antisocial behaviour in their daily lives often find that riding provides an absorbing new challenge which can take the place of disruptive activities and for others it builds confidence and self-esteem. A group of 11 students came to visit The British Racing School and the National Stud today to learn about careers in racing, they saw racehorses on the gallops, newborn foals at the stud and learned what is might be like to come on our Foundation Apprenticeship in Racehorse Care once they leave school. We all had a great day (BRS staff included!) finding out about one another’s organisations and exploring ways in which we might work together in the future, to build on the amazing work that Ride High does with these children. Group leader Kim said “we had a very enjoyable visit, it is a great career opportunity for these students”.